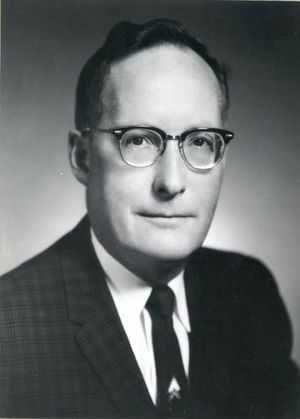 William G. Shepherd, IEEE President, 1966, was Professor and Head at the Department of Electrical Engineering of the University of Minnesota. He invented (with John Pierce) the Pierce-Shepherd tube, which improved radar capabilities during World War II. Born in Fort William, Ontario, Shepherd immigrated to the U.S. with his family as a child. Shepherd earned his BS in engineering and his doctorate in physics at the University of Minnesota. After graduating, Shepherd worked for 10 years at Bell Telephone Laboratories in New York City, USA. In 1943, he and colleague John Pierce invented the Pierce-Shepherd tube, which greatly enhanced radar capabilities during World War II. However, Shepherd spent most of his 42-year-long professional career at his alma mater, the University of Minnesota-Twin Cities in Minneapolis-St. Paul, USA. In 1947, he became a professor of engineering at the university and held various positions there, including associate dean of the university's Institute of Technology from 1954 to 1956, head of the electrical engineering department from 1956 to 1963, and vice president of academic affairs in 1963. He also served as the director of the university's Space Science Center, a position he held until his retirement in 1979. Shepherd continued to be active in his retirement years. He served as chair of the National Association of State Universities and Land Grant Colleges. In addition, he worked as a consultant to many international commissions and private industries, and was a member of several of the governor's commissions for Minnesota industry. Shepherd was IEEE president in 1966. This page was last edited on 9 March 2016, at 16:24.